Westcott 6" Kleen earth scissors in blue/gray color is ideal for use around the office, mailroom and is perfect for right or left hand use. 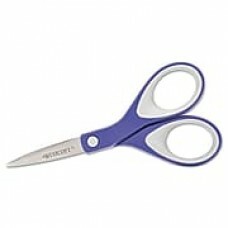 Westcott 6" Kleen earth scissors in blue/gray color features recycled cushioned soft-handles for comfort and easy cutting. Scissors have an insert molded design for added durability and have corrosion-resistant stainless steel blades.